Shipwrecks UK Ltd was originally established to develop the resources of Richard and Bridget Larn's Shipwreck Index of the British Isles and Shipwreck Index of Ireland. From the outset, interactive mapping of the contents was a priority and the information began to come alive in a new way, as the team expanded and refined the data for its new purpose. See the Reviewers Comments section of this website for reactions to the Shipwrecks UK resource from some very well-qualified commentators. The development of the resource has provided a springboard for considerable expansion and enhancement of the shipwrecks data and its search and analysis capabilties so that it is now considerably extended beyond the content of the Index volumes. It remains highly effective as a research tool. Richard Larn, Chairman of Shipwrecks UK Ltd, has been diving on shipwrecks for 60 years, working not only on many of Britain's most historic sites but also all round the world. He opted to go to a sea training school at 14, going on to become 2nd Officer in the Merchant Navy, followed by 22 years in the Royal Navy, leaving as a Chief Petty Officer Mechanician/Diver. While in the RN, he pioneered the use of rescue divers operating from SAR helicopters and became actively involved in shipwreck discovery, salvage and archaeology. Richard was one of six new Cornish Bards honoured at the Gorsedd of Cornwall at Redruth on Saturday, 2nd September 2006 and was chosen for his promotion of maritime history in Cornwall and the Isles of Scilly. 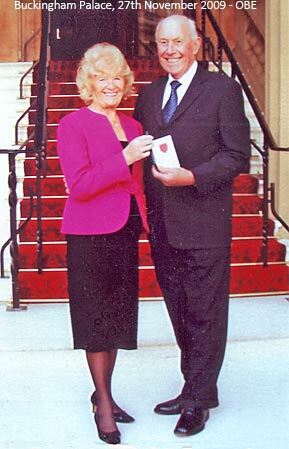 In 2009 he was appointed an OBE for services to nautical archaeology and marine heritage. With his wife Bridget, Richard started the Charlestown Shipwreck Heritage Centre in 1976, and they were joint owners and Curators for 22 years of the largest collection of shipwreck artefacts on public display in Europe. Bridget was joint-author of the six Shipwreck Index volumes. Richard was managing director of Prodive Ltd, in Falmouth Docks, a Commercial Diving Training School he started on leaving the Royal Navy, and he and his wife have written some 36 books on shipwrecks and the sea. Their six volume work with Lloyd's Register of Shipping, the acclaimed 'Shipwreck Index of the British Isles', was used by the Government's Royal Commission for Historic Monuments to establish the National Maritime Record, followed by a similar record for the Scottish and Welsh Governments. 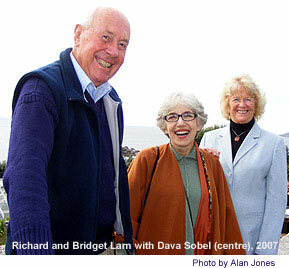 Both Richard & Bridget see Shipwrecks UK as a natural progression of their research and writing. bring their decades of work to an ever-widening public arena, through development of a tool - with Alan Jones - that reveals all the underlying themes and patterns of the underlying events of close to 50,000 shipwrecks in our seas, while rapidly finding 'needles in haystacks'. Shipwrecks of South Devon. 2000 Bossiney Books Ltd.
Alan Jones designed and developed the new Shipwrecks UK system and is continuing its expansion as Managing Director of Shipwrecks UK Ltd. He is a former RAF wing commander who began his association with SCUBA diving in 1966. The Shipwrecks UK system has been engineered to map shipwrecks dynamically, and this is key to presentation of the detailed information. It is eyecatching and user-friendly while being a serious and powerful research tool. The context for the wrecks and links with associated events, locations, shipbuilders, etc, etc becomes readily apparent.